The development of air quality models started from the 1960s, with the atmospheric phenomena such as acid deposition, increasing greenhouse gas concentrations, stratospheric ozone depletion, direct and indirect climatic response to anthropogenic sulfur and increasing tropospheric ozone concentrations have been the focus of large national research programs since then. Over the next 10-20 years, many difficult decisions will have to be made by policymakers worldwide to deal with these and other problems. The atmospheric sciences community must continue and strive to increase, its effort to lay a firm scientific foundation on which those policy decisions can be based. As the important tools for regulatory, policy, and environmental research communities, with the scientists seeking to understand the physical-chemical systems of the atmosphere and the technical development of computer science and so on, air quality simulation models can be classified into three generations in a broad sense. As a group, the first-generation models had relatively simple chemistry (perhaps a few reactions or first-order chemistry) and no dry deposition processes included. The second-generation models expanded the chemical mechanisms, included dry and, in some cases, wet deposition processes, and were based on improved numerical integration schemes. The third-generation, models contain interactions among chemistry, deposition processes and meteorology. The most widely used models of the three generations are listed in table 7.1.5-1, along with their characteristics. 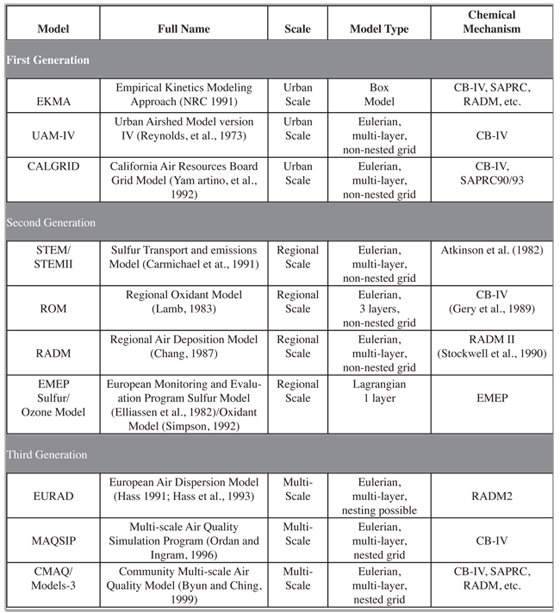 The first generation air quality models, known as the Gaussian diffusion models have their origin in the 1970s as developed for the study of urban and regional scale air pollution, in assessing the impacts of existing and proposed sources of air pollution on local and urban air quality, particularly for nonreactive pollutants regulatory applications. The basic theory of Gaussian dispersion goes back to the early 1920s when foundations of gradient transport and statistical theories of diffusion were laid. A stronger theoretical basis, without recourse to the questionable gradient transport hypothesis, was later provided by the statistical theories and random-walk models of particle dispersion in homogeneous turbulent flows. Theoretical basis for Gaussian diffusion models is limited to idealized uniform flows with homogeneous turbulence. The box photochemical models, which are determined to solve the ozone pollutions, are developed fast in the same time. The development and application of these first generation models were severely restricted by: (a) simplified physics and parameterization of complex turbulence and diffusion processes; (b) highly parameterized formulations for chemical transformation, usually with both gas and aqueous-phase reactions lumped into one overall transformation rate. (c) the lack of emissions inventories (or even data on which to base an inventory) for the species of interest; (d) the scarcity of observational data to constrain model input parameters and to evaluate model performance; and (e) insufficient computer power and memory to implement the model over the temporal and spatial scales of interest, (most are zero or one dimensional). The milestones of the second generation air quality models, known as the regional acid deposition models, started the development and evaluation with the attention to acid deposition issues addressed in the 1980s. On the basis of Gaussian dispersion and box models, the second generation models incorporate the treatment of gas and aqueous phase chemistry, and cloud and precipitation scavenging processes with the science research. The genre of models of this period were designed to address specific air pollution issues such as ozone or acid deposition and to be applied under relatively prescriptive implementation guidance strategies. Second-generation models have distinct advance in: (a) incorporate more accurate boundary-layer and turbulence parameterizations, considering inhomogeneities of the underlying surface including topography; (b) employ extensive gas- and aqueous-phase chemical mechanisms and explicitly track numerous trace species concentrations (usually 30-60 species); (c) include a more detailed numerical formulation for physical and chemical processes occurring within and below precipitating clouds; (d) dimensionality increases with the complexity and accuracy of the models. But the flexibility to deal with a wide range of additional issues were both cumbersome and limiting, including visibility, fine and coarse particles, indirect exposure to toxic pollutants such as heavy metals, semi-volatile organic species, and nutrient deposition to water bodies. While the first and second generation air quality models have been periodically updated, none of them have been fundamentally restructured to accommodate the most recent developments in science and computing, neither for the requirement of regulatory and air quality management. Up to now, air quality model paradigms typically addressed individual pollutant issues separately confined in fixed scale. However, it is becoming increasingly evident that when pollutant issues are treated locally in isolation, the resulting control strategies may solve one set of problems but may lead to unexpected aggravation of other related pollutant issues in regional scale. Pollutants in the atmosphere are subject to myriad transport processes and transformation pathways that control their composition and levels. Also, pollutant concentration fields are sensitive to the type and history of the atmospheric mixtures of different chemical compounds in the whole system. Besides, complex and professional alternative modules of physics and chemistry mechanism in modeling process, cause operational difficulties of policymaking applications. The direct response approach is to modify, adapt or extend current second generation models to handle more complex implementations and issues. With projections for the increasing rapid pace of the development of computational capabilities at the start of the nineties, the opportunity arose for a strategic review of modeling approaches leading to design of a system that would both meet and keep pace with the increasing requirements on air quality modeling, of incorporating advances in state-of-science descriptions of atmospheric processes, as well as eliminate impediments of the current genre of models. The scope of such a system must be able to process great and diverse information from complicated emissions mixtures and complex distributions of sources, to modeling the complexities of atmospheric processes that transport and transform these mixtures in a dynamic environment that operates on a large range of time scales covering minutes to days and weeks. The corresponding spatial scales are commensurately large, ranging from local to continental scales. On these temporal and spatial scales, emissions from chemical manufacturing and other industrial activities, power generation, transportation, and waste treatment activities contribute to a variety of air pollution issues including visibility, ozone, particulate matter (PM), and acid, nutrient and toxic deposition. The residence times of pollutants in the atmosphere can extend to multiple days, therefore transport must be considered on at least a regional scale. NAAQS requirements and other goals for a cleaner environment vary over a range of time scales, from peak hourly to annual averages. These challenges suggest that more comprehensive approaches to air quality modeling are needed, and that assessments and pollution mitigation are achieved more successfully when the problems are viewed in a “one atmosphere” context that considers multiple pollutant issues.